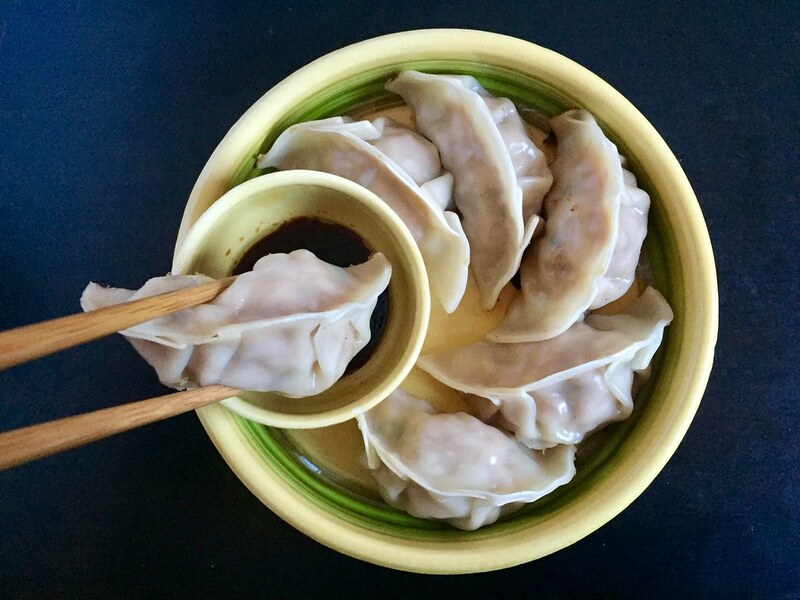 Next up in my updated posts is my mom's pork and cabbage dumplings! I made these slightly healthier by substituting some of the pork for tofu and reducing the soy sauce, sesame oil, and sugar a bit. See my original post from 9(!) 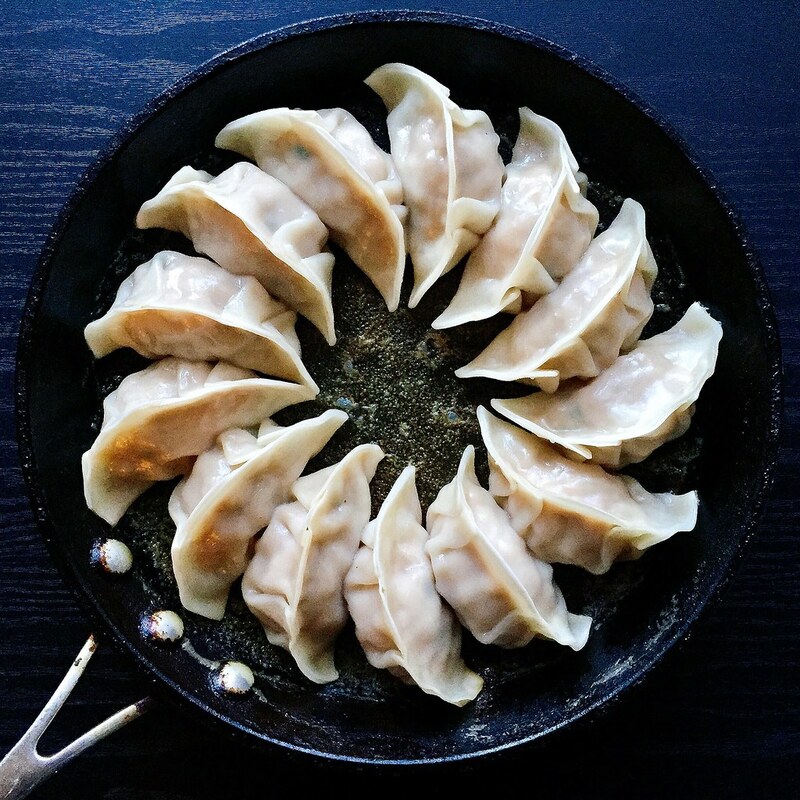 years ago for a lot of tips and tricks to making and cooking the dumplings (as well as to see how my photography skills have improved over the years, haha). Press the tofu between a couple layers of paper towels for 15 minutes. Soak the bean thread vermicelli in lukewarm water for 15 minutes. Use a food processor to finely chop the napa cabbage and scallions. Transfer to a large bowl. Chop the softened noodles and add to the cabbage. Crumble the tofu into the bowl and add the pork. Add the soy sauce, sesame oil, and sugar and mix well. 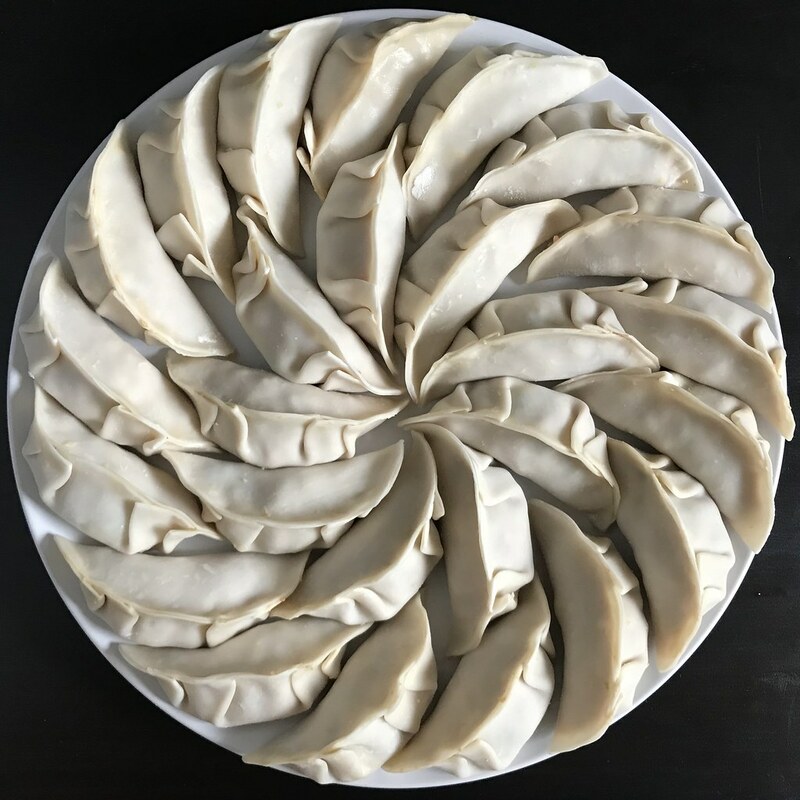 Fill the dumpling skins and seal the wrappers with a little water on the edges. Boil or steam-fry the dumplings and serve. 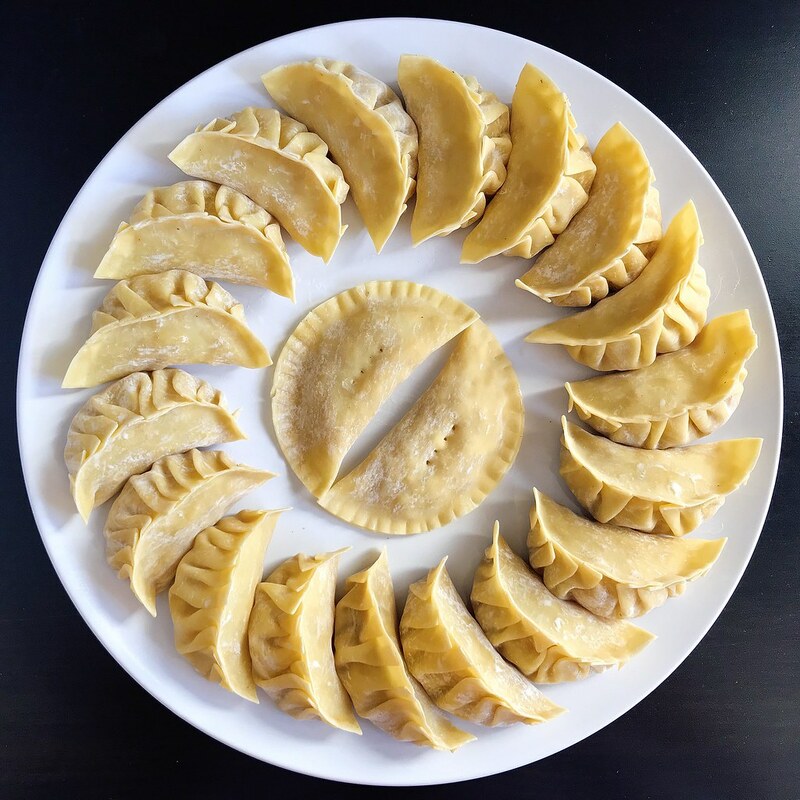 If not eating immediately, place the plates of filled dumplings in the freezer until firm, then transfer to freezer bags. I first wrote up my mom's hua juan recipe almost 9 years ago so I figured it's time to give a little update. 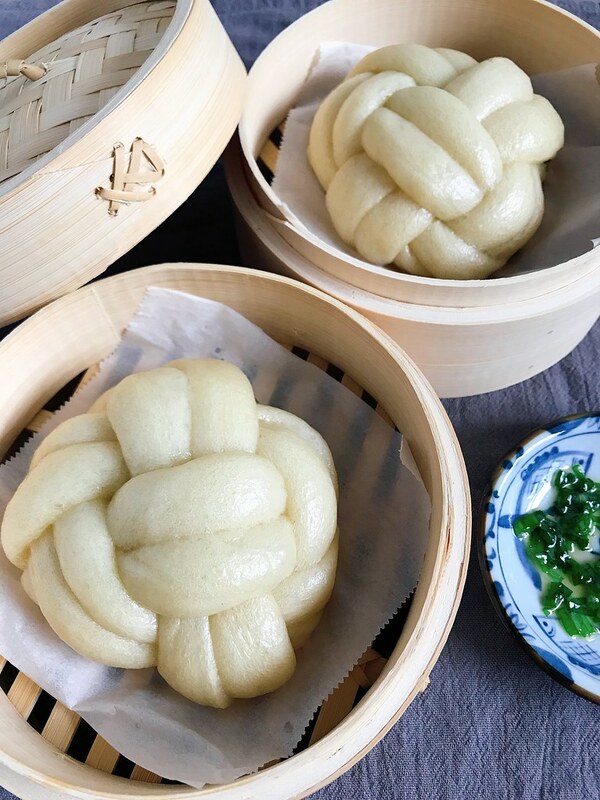 You can use this recipe to make regular steamed mantou, or fill them to make different types of baozi, but my favorite is still hua juan, which is just the regular bao dough with a sesame-scallion glaze twisted into a flower shape. 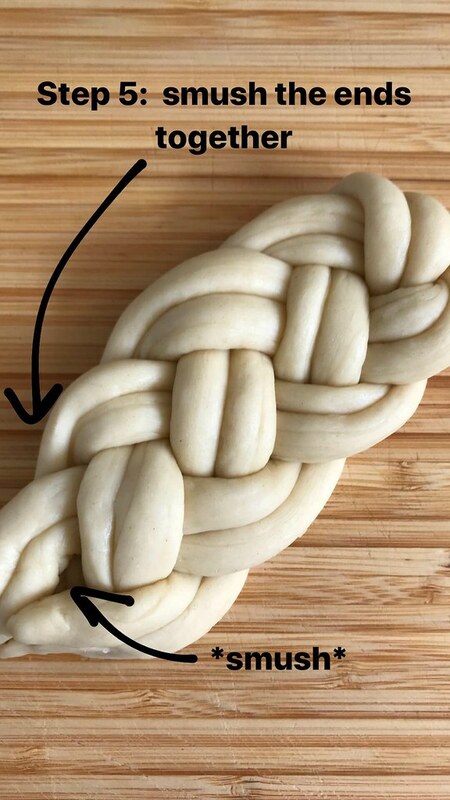 I recently came across this new way to shape bread called a Winston knot. There aren't many videos of how to make it online, and the one I used wasn't even that good, but once you get the idea it's pretty easy. You can make it with two single strips or two double strips like I did here. I think the most popular one I've seen is with two triple strips; the resulting bun looks like a volleyball! 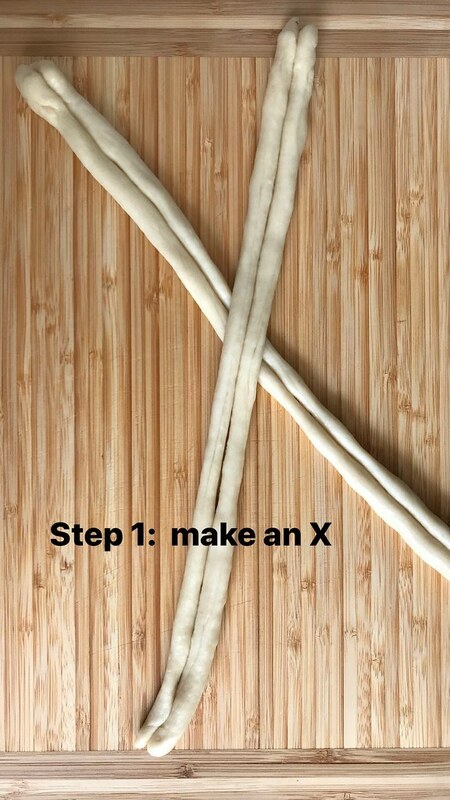 The first step is to make an X with the strips. Then you'll cross one half of the bottom strip over. Now take the strip that's on the bottom of this picture and weave it through the other 3 strips. Continue taking the strip on the bottom (or on the right after rotating 90 degrees) and weaving it through the other 3 strips. 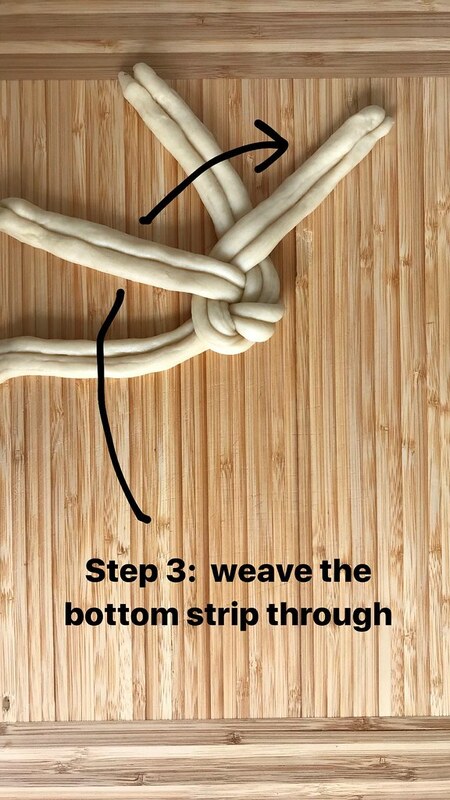 When you run out of dough to weave, smush the ends all together. 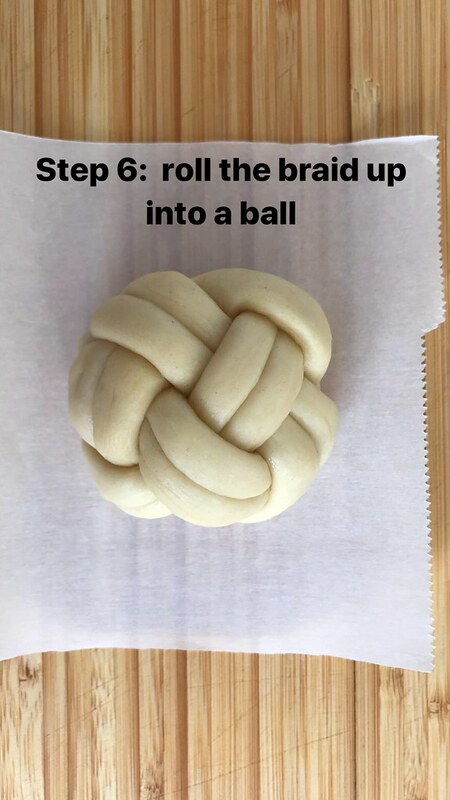 Then roll the braid up into a ball with the smushed end on the inside. That's it! 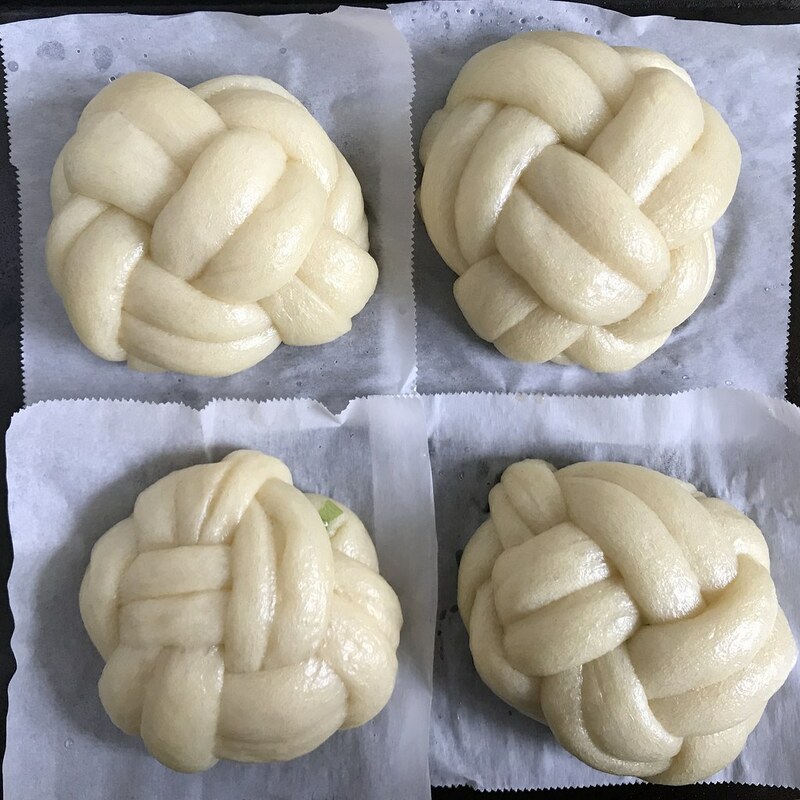 For these buns I decided to apply the sesame-scallion glaze only on the inside of the bun so the outside would stay immaculately white. Turn the oven on to the lowest setting (mine is 170°F). Dissolve the yeast in the warm milk. If you don't have a thermometer, the milk should feel a little warmer than a fever. Combine the flour and sugar, then add the milk mixture and oil. 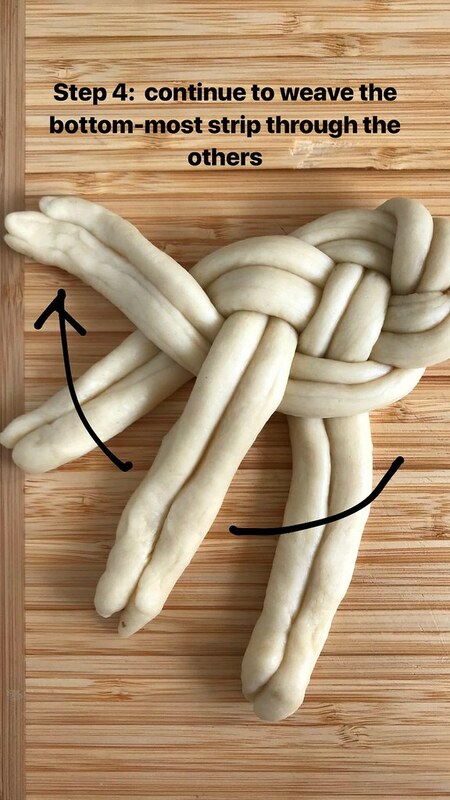 Mix together until a dough forms and knead a few minutes until smooth. 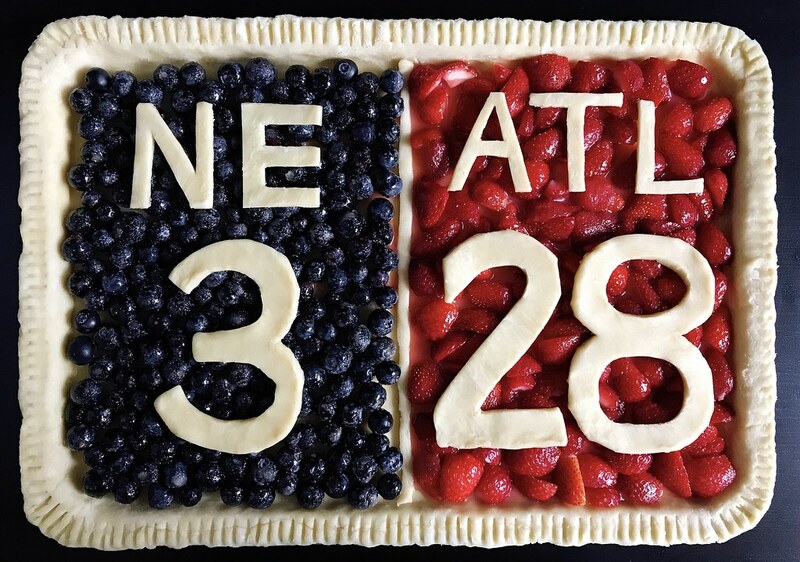 Cover the bowl and place in the oven. Turn off the heat and let the dough proof for an hour or until doubled. Once the dough has doubled, remove from the oven and turn the oven on again to the lowest setting. Punch the dough down and knead a few more times. Divide into twelve equal pieces (I divide in half twice and then divide each quarter into thirds). Shape and fill the dough at this point if desired. 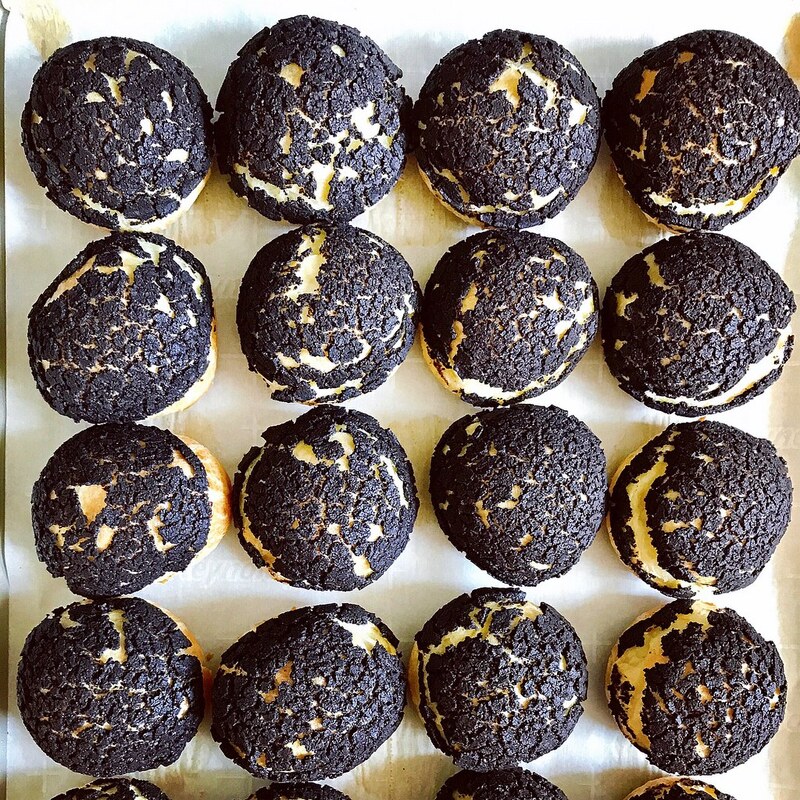 Place each bun on a square of parchment paper. Cover and place in the oven, turning off the oven again. Let proof another 40-60 minutes. 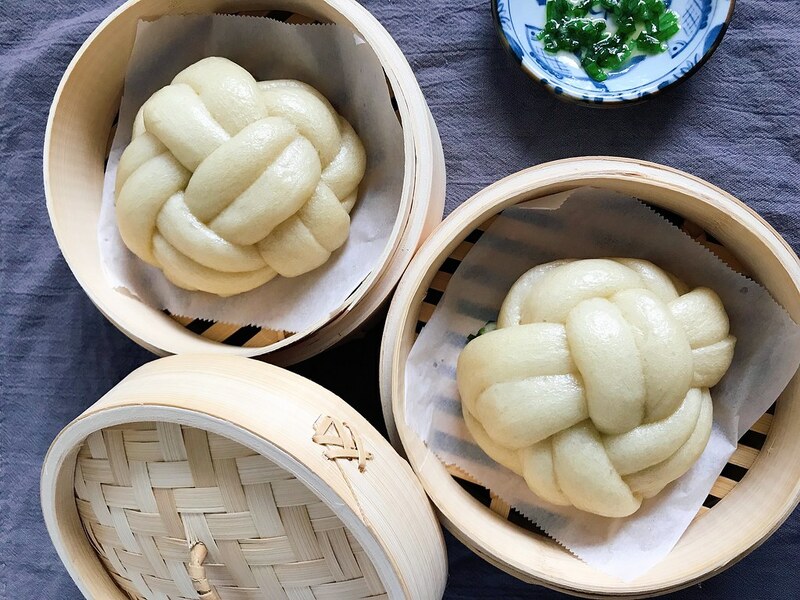 Steam the buns for 13 minutes. I use my stockpot with the pasta insert as one level and the steamer insert as a second level so I can steam 6 at a time. If not eating immediately, freeze and reheat in the microwave before eating. I was first introduced to slow-roasted salmon when the Food52 Cookbook Club was going through Samin Nosrat's Salt Fat Acid Heat back in September. I tried the citrus version with lemon vinaigrette first and was absolutely smitten. As incredible as the citrus and vinaigrette were, I think it was the salt and slow-roasting that made the dish truly exceptional. 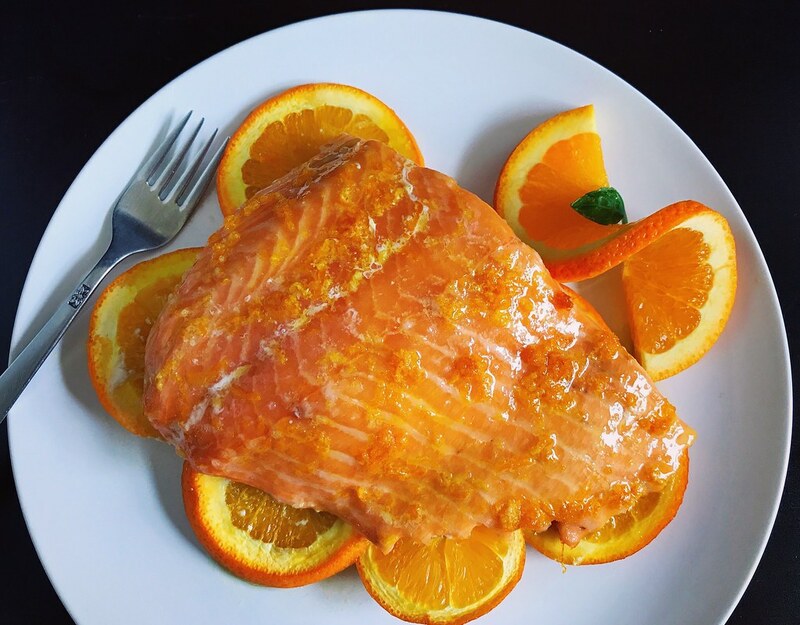 It made a regular farm-raised salmon filet taste like a wild-caught Copper River King salmon! The salmon was moist, rich, and buttery without being slimy or fishy. I also tried her soy-glazed version, and it turned out amazing as well, but having to baste the fillet every 15 minutes was kind of too fussy for me. 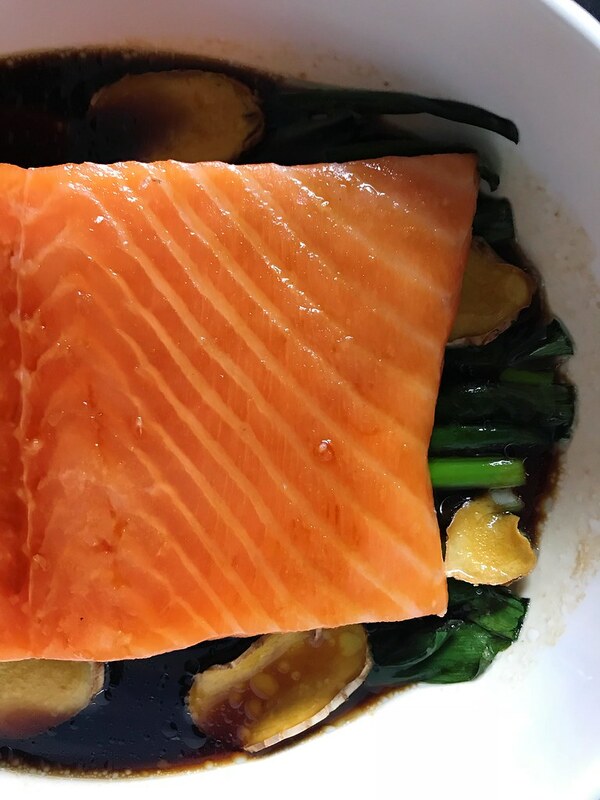 I decided I needed to combine the recipe for Grace's ginger scallion fish with this method of cooking salmon and found some friends who were interested in testing out the recipe. I also found some friends who had poor reading comprehension and thought I was offering them free food, haha. 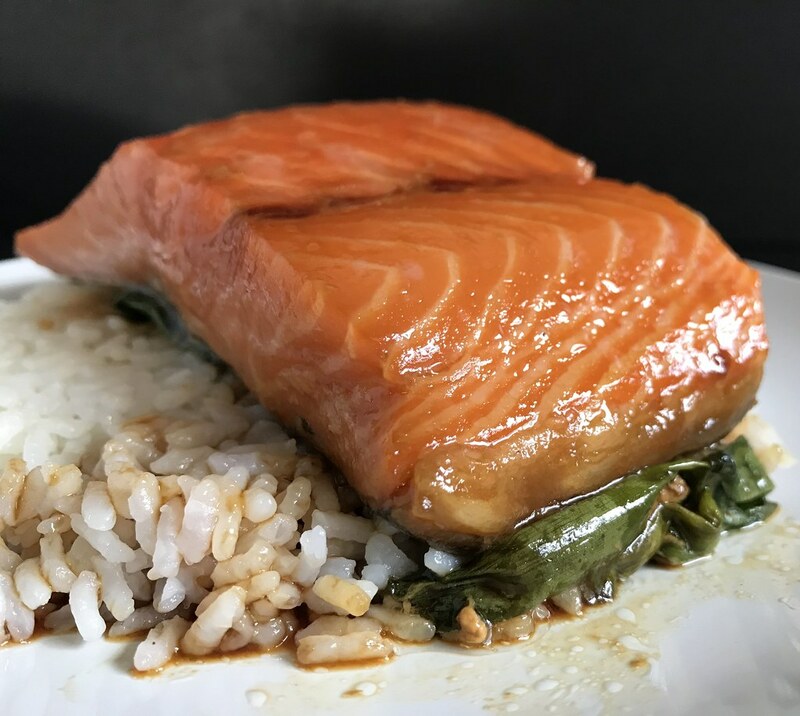 We tested roasting the salmon with the skin side up, down, and skinless, and I found that skin side down worked the best. The skin shielded the fish from too much heat from below, and this version produced the least dry fillet. The skin never really gets crispy, though, so unless you enjoy rubbery skin, I wouldn't serve that part. Also, the reason I wrote that the salmon should be straight from the fridge is because some people were using frozen salmon which they let thaw on their counter before using. Their salmon came out overdone in the time frame I gave so, if you are also making this with warmer-than-refrigerator salmon, reduce the time in the oven accordingly. Combine the sugar, soy sauce, rice wine, and water and heat for 1 minutes in the microwave. Stir to dissolve the sugar. 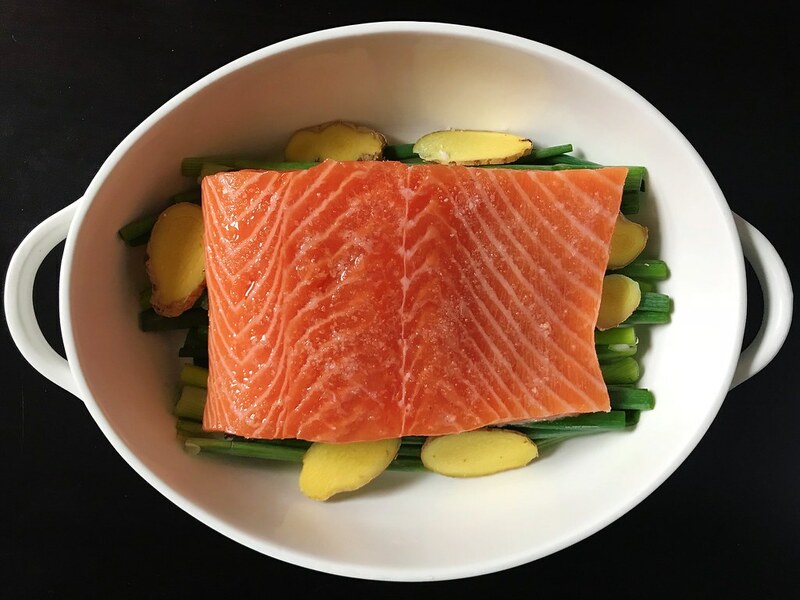 Line a small baking dish with the scallions and ginger and place salmon on top, skin side down. Season the salmon liberally with kosher salt and coat with oil. 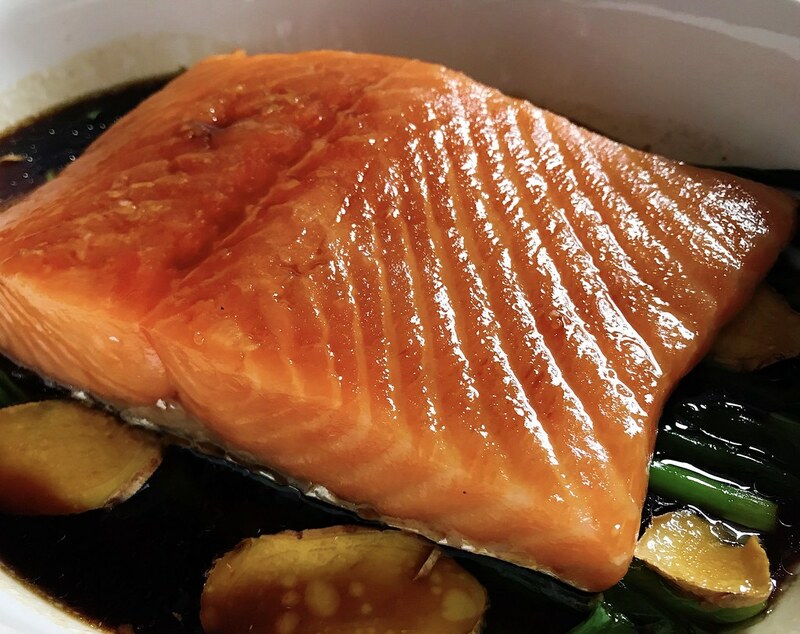 Pour the soy sauce mixture over the fish and roast the salmon for about 40-50 minutes, or until a thermometer stuck into the thickest part reads 110-120°F. The fish should still look a lot like how it did when it went in (i.e. almost translucent), so if you don't have a thermometer, check for doneness by poking the thickest part; it will start to flake once it is ready. Serve with rice and spoon some of the sauce on top for extra saucy goodness. You know how sometimes something is really, really hyped up and you're just like, "uh huh, okay, but it can't actually be that amazing." 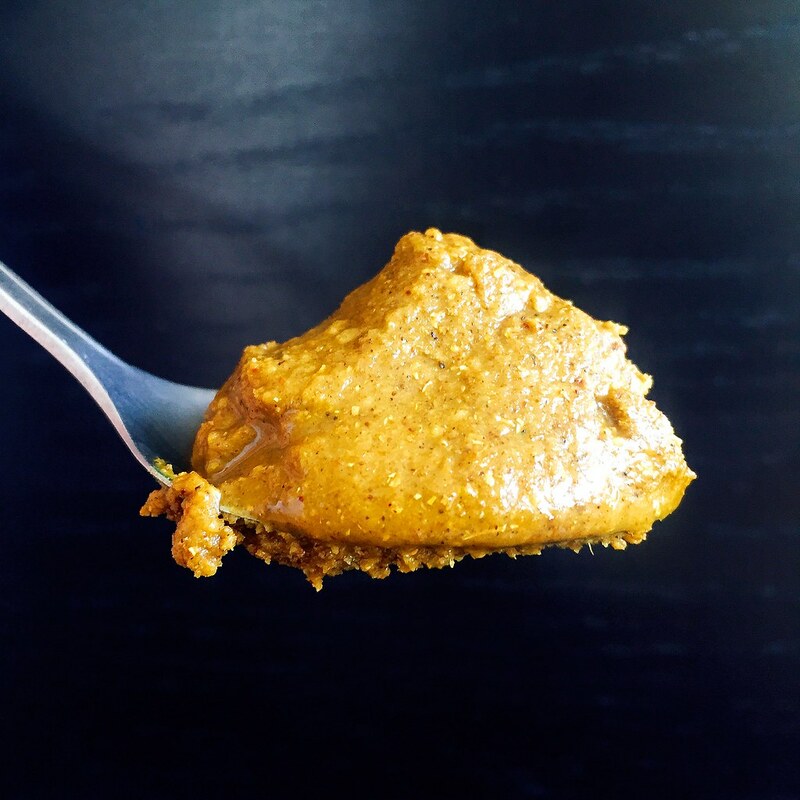 Well, I just wanted to let you know that miso caramel is *actually* that amazing! 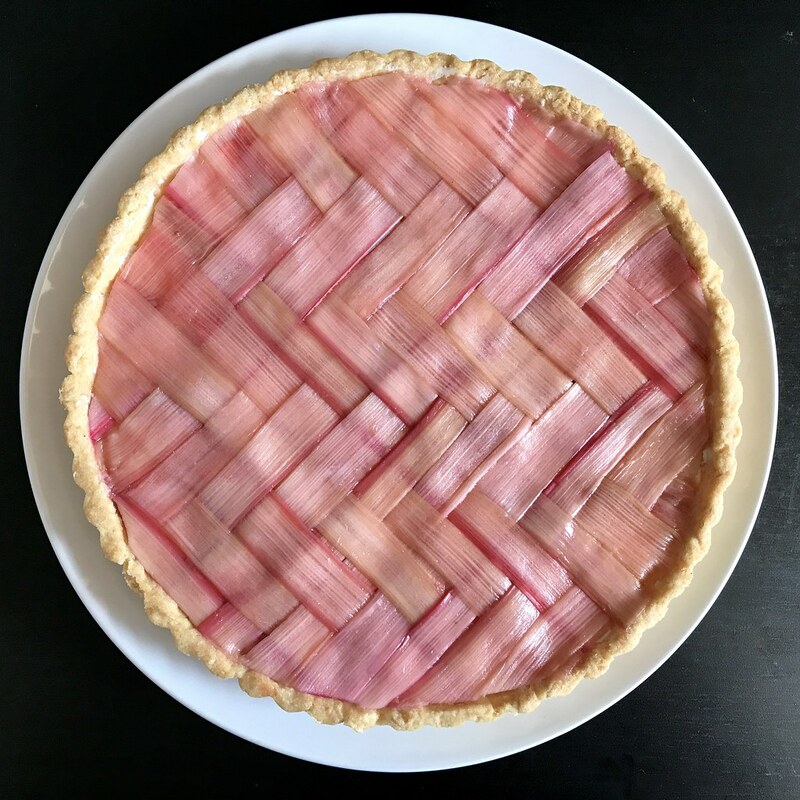 I first heard about it on Food52, but then I noticed that some of my favorite food bloggers were also incorporating it into their apple pies and raving about it. It is rather rich and strong so it might not be for everyone, but if you like salted caramel and miso, you'll probably love this caramel too. The best way I can describe it is "flavor bomb". Try it on ice cream, in apple pies, with apple slices, or just straight out of the jar! 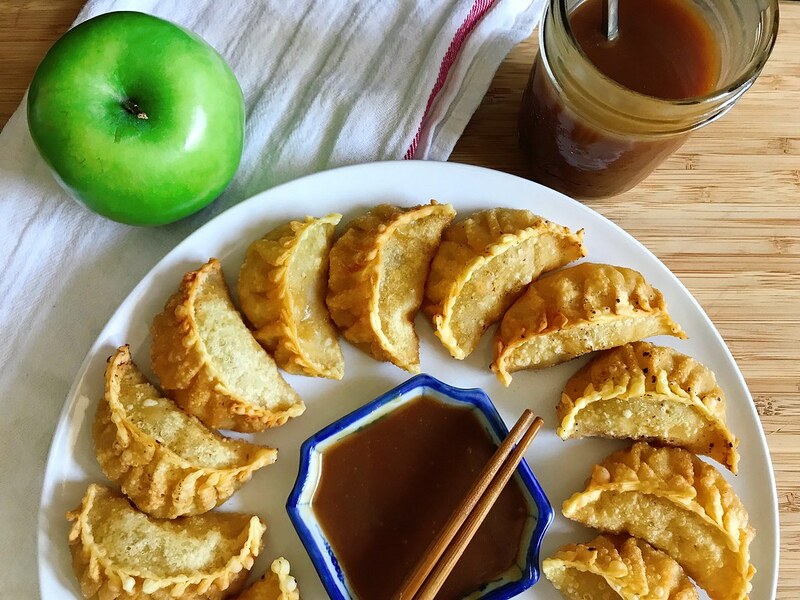 The reason I even decided to make miso caramel is because I was invited by Rebecca and Ruth from Square Meal Round Table to join a fall collaboration with a bunch of other Instagrammers/food bloggers centered around the prompt #Aisforalltheapples. 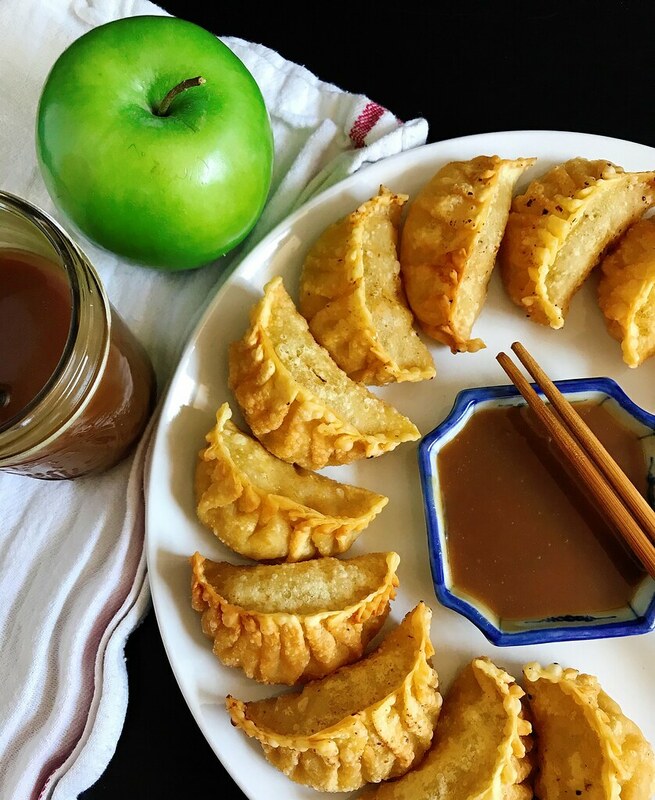 I had the idea to make apple dumplings, but not the American baked kind using pastry dough; I wanted to make them with Hong Kong style dumpling skins and shape them like pot stickers. Get it? Instead of pan-frying them, though, I was going to deep fry them like McDonald's used to fry their apple pies! And I figured to continue with the Asian twist, I'd pair the apple dumplings with miso caramel sauce. 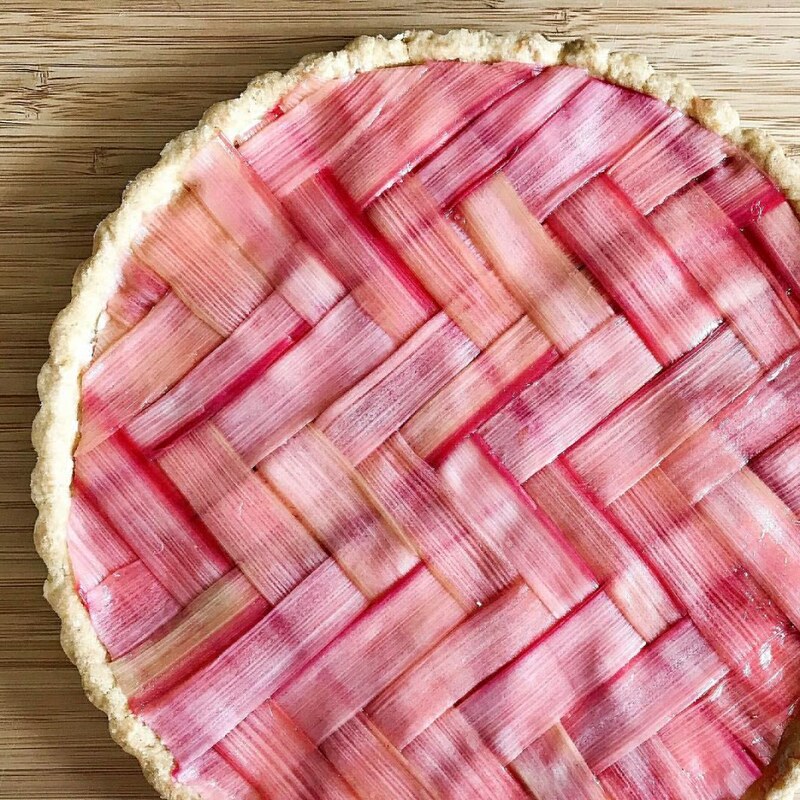 When it came time to shape the dumplings, I decided to go a little crazy with the pleating since I knew I wasn't making that many, but it's entirely unnecessary to do that many pleats. 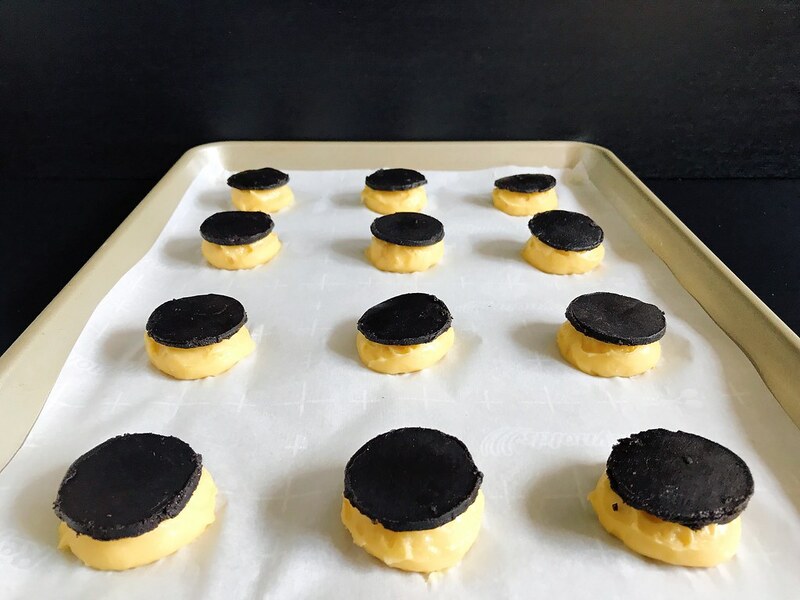 In fact, I also experimented with making a couple that were just folded in half, sealed, and then crimped with a fork so that the looked like little hand pies (see above). This shape was actually the easiest to fry evenly and dip in the caramel, so I'd probably make them this way in the future, unless I specifically wanted the pot sticker shape. Peel the apples and finely dice. Mix with the brown sugar, cinnamon, cornstarch, and salt in a small saucepan. Heat over medium-low heat for about 5 minutes, until the apples are tender and liquid starts to form. Transfer to a bowl and allow to cool to room temperature. Wet the edges of the dumpling skins and fill with the apple mixture. Seal tightly. Heat the oil in a pot to 350°F. 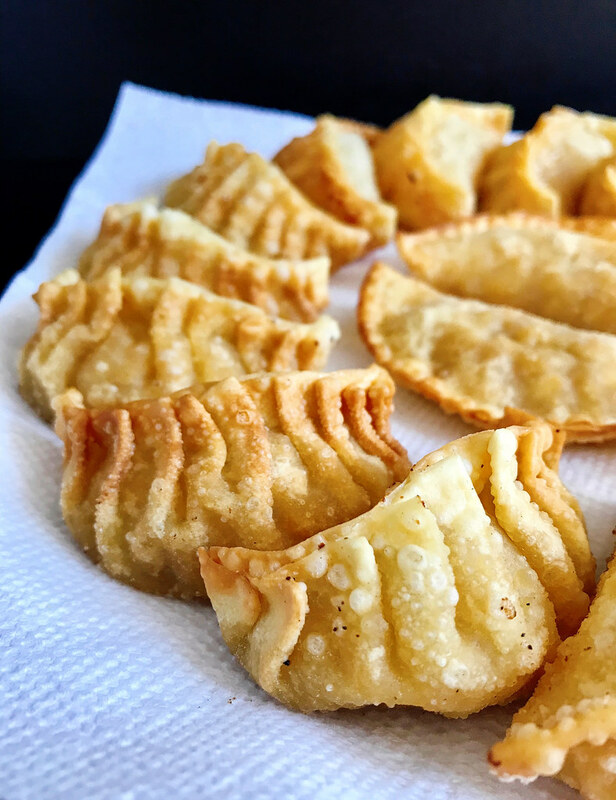 Fry the dumplings until golden brown and drain on a paper towel-lined plate. 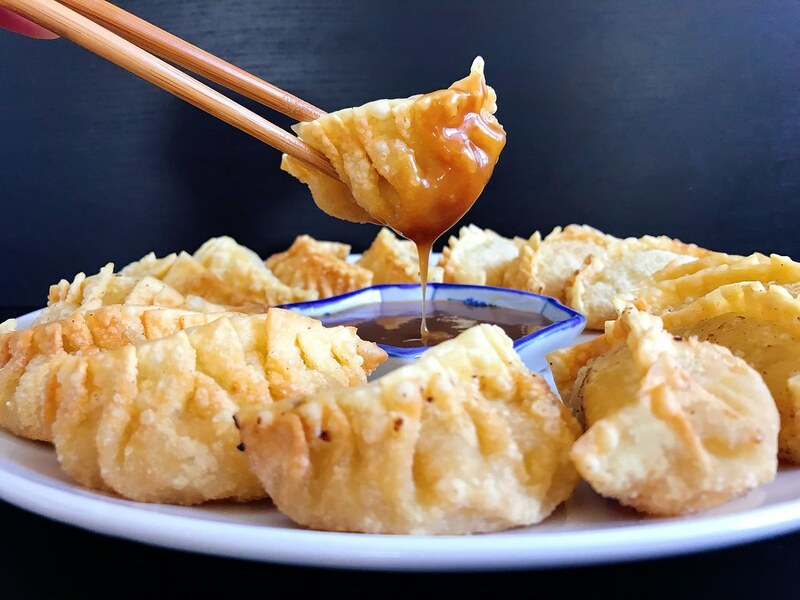 Serve immediately with the miso caramel dipping sauce (recipe below). Heat the sugar and water over medium-high heat in a medium saucepan. Bring to a boil and continue to cook without stirring until it turns a medium amber and wisps of smoke just start to appear. Immediately remove from heat and whisk in the heavy cream. If the caramel seizes, just return the pan to low heat and continue to whisk until everything is liquid again. Whisk in the miso. Pour into a glass jar and store in the refrigerator if not using immediately. Rewarm briefly in the microwave before using after refrigeration. Check out the rest of the entries in this collaboration below! Farm and Coast Cookery’s Apple Cider Donut "French Toast"
I've been toying with the idea to make these ever since I saw an article on Food52 about someone who folded wonton skins into origami cranes and deep fried them. Naturally the only logical progression would be to stuff them with cream cheese and make crane rangoons, right? My mom taught me how to fold paper cranes when I was a kid, and it's basically muscle memory for me, but if you're not familiar with how to fold a crane you'll definitely want to practice with paper first. One thing I realized as I was doing research for this post is that the way my mom taught me how to fold a paper crane is different than the most popular way on the internet. In fact, I can't seem to find a single tutorial showing the method my mom taught me! It's a very disorienting feeling to realize that something that you thought everyone else knew is actually just something only your family knows. Anyways, for science, I tried both ways with a wonton skin, and there doesn't seem to be too much of a difference. I think the hollow space in the crane's body may be a tad larger using my mom's method, and the tail and head are a bit fatter so it's a little easier to have a defined head. 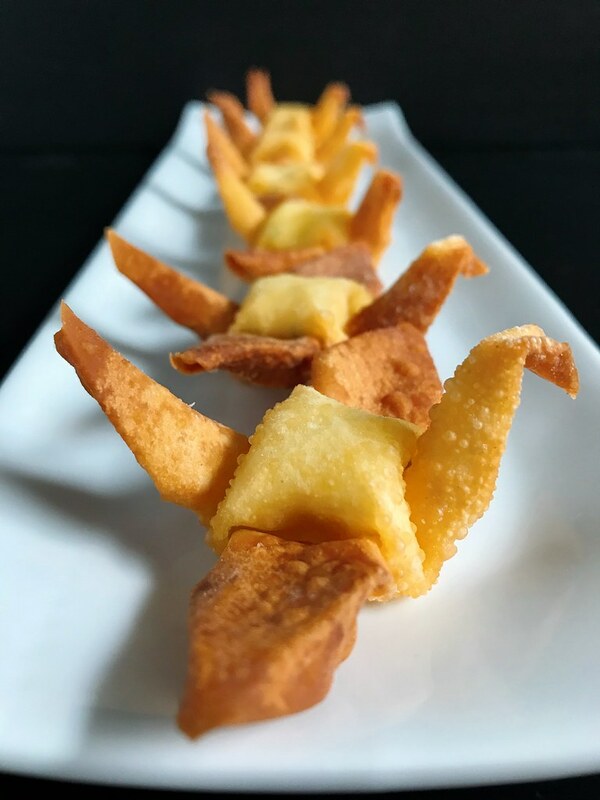 Both honestly, I'm not sure those differences are a big enough of a deal to learn a new way to fold a crane, especially since it's hard enough folding one with a wonton skin. 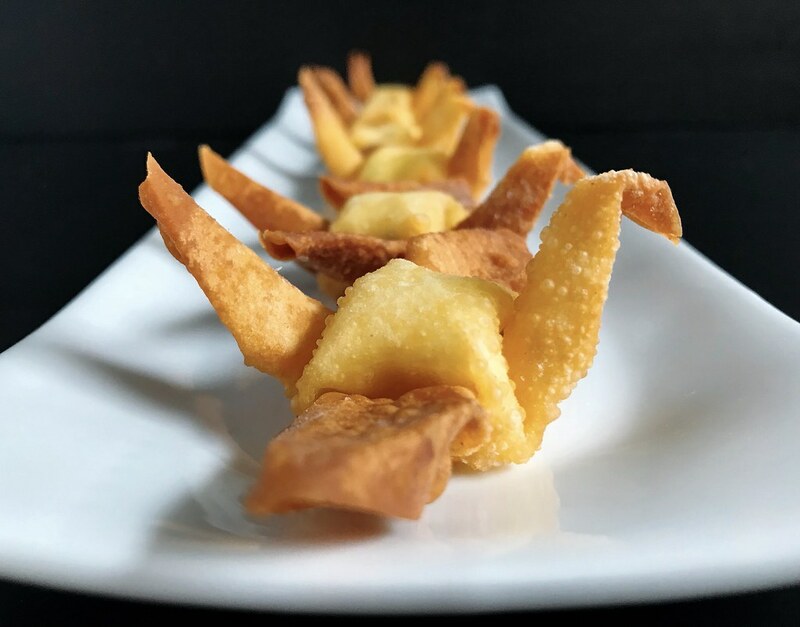 You will want to get the freshest, most pliable wonton skins you can find, and the thinner the better. The ones I used weren't a perfect square, but you can still get a pretty decent looking crane. 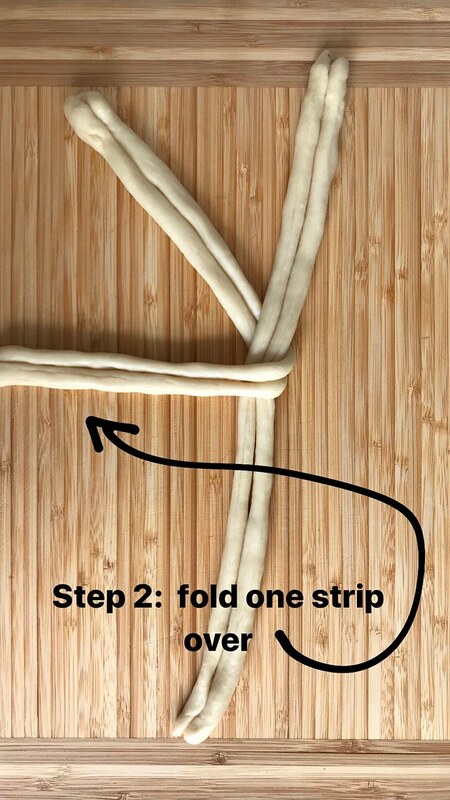 Also, instead of making perfect creases like you'd usually do with paper, you want to try not to press down too hard on any folds so that the wonton skin doesn't break. 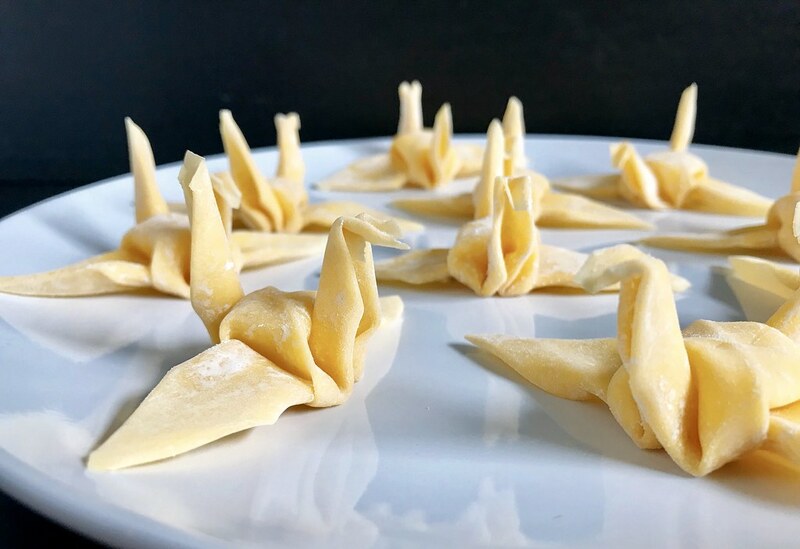 After I finished folding the cranes, I microwaved them for 8-10 seconds, just enough to make them a little stiffer, but not totally cooked. Basically I watched them as they microwaved and pulled them out as soon as they started to distort. At that point, I was still able to manipulate them back into the desired shape. Then I whipped up some softened cream cheese with some chopped scallions and a pinch or two of salt. To fill the cranes, I used a piping bag with a no. 12 round tip. A slightly smaller tip would probably have been a little better, but you don't want to use a tiny one or else the scallions might get stuck in the tip. I deep fried the crane rangoons in 375°F oil until they were golden brown. After some trial and error, it seemed like frying them upside down was the best way to get them to cook as evenly as possible. When they were done, I let them drain on a paper towel-lined plate. My friend Christine and I have been making a day trip to Portland, ME every summer for the last couple of years and basically spend the day stuffing ourselves. 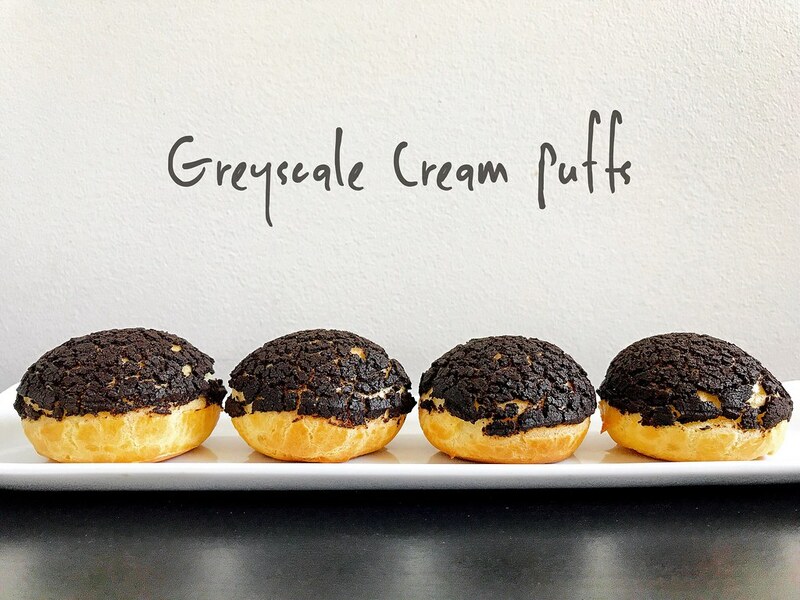 We always go to Eventide Oysters for my favorite lobster rolls, The Holy Donut for potato donuts, Duckfat for their fries, and Gelato Fiasco for ice cream (the honeycomb ice cream sundae from Honeypaw has made it onto our itinerary for the last 2 years as well). 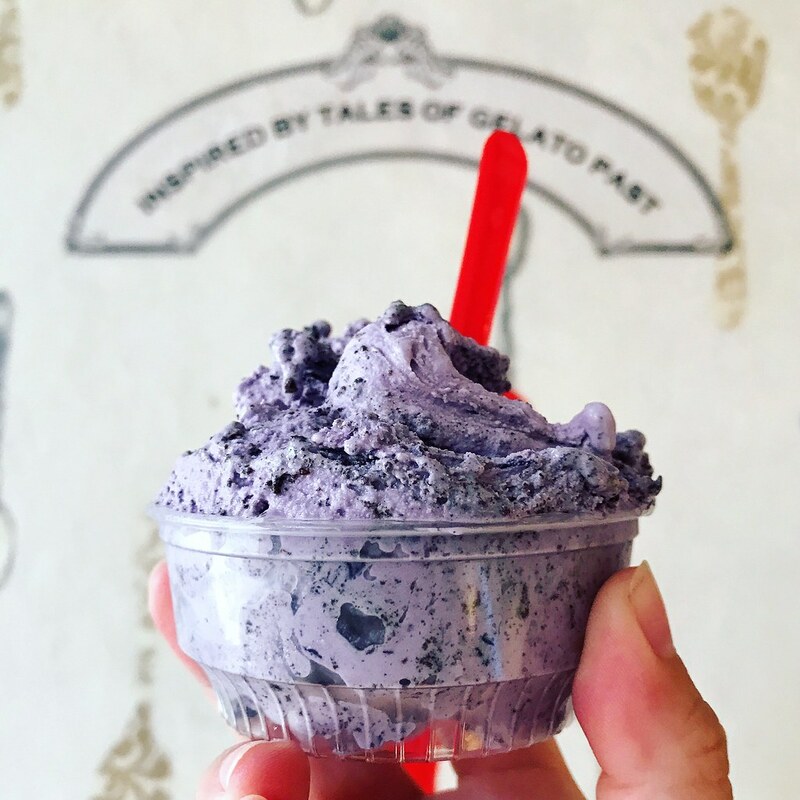 My favorite flavor is the Maine Wild Blueberry Caramel Sea Salt Stracciatella gelato, but they didn't have it this year so I had to settle for the Blueberry Milk and Cookies flavor which was still really good. So when Boston Organics contacted me and offered to send me a 5 lb. box of their wild Maine blueberries, I knew the first thing I wanted to make with them. 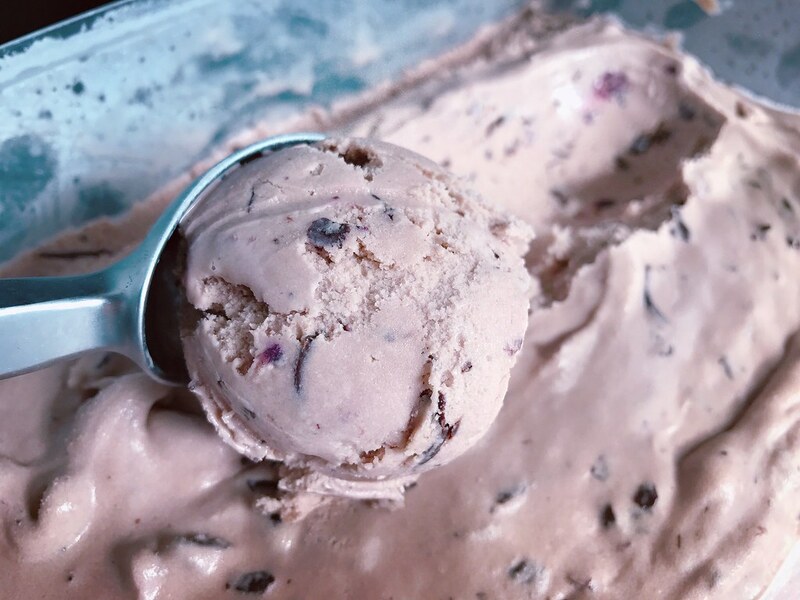 I consulted with my favorite ice cream cookbook, Jeni's Splendid Ice Creams at Home, and realized I could make something similar using her salty caramel ice cream recipe, adding some blueberry compote, and then swirling in some chocolate freckles when the ice cream was almost done churning. 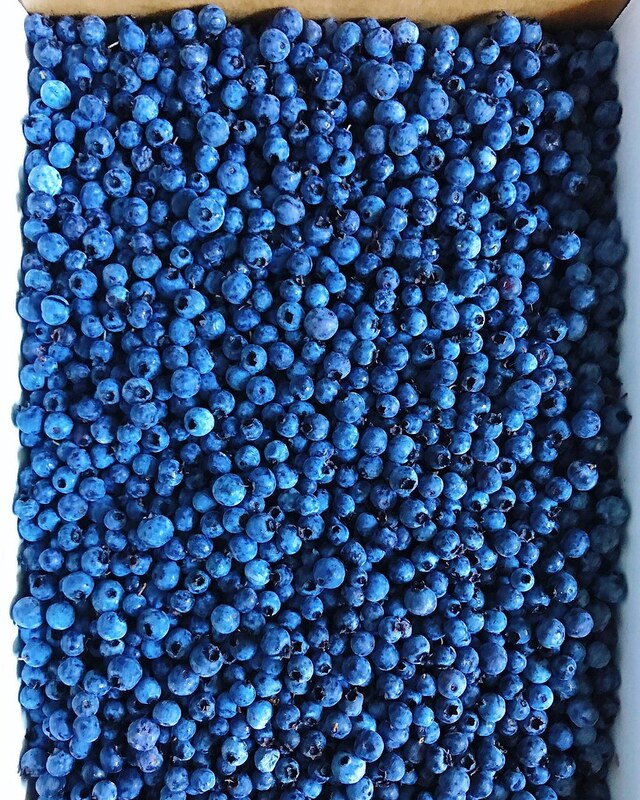 I also wanted to share some more information about these wonderful blueberries because they're so different from the ones you usually find in the grocery store. These are from Burke Hill Farm in Cherryfield, ME and come in a compact wax box that will fit perfectly in most freezers. Known as lowbush blueberries, these wild blueberries grow in northern New England’s naturally acidic soil and are resilient enough to withstand the region's icy winters. They're smaller and sweeter than the highbush berries you're probably used to, and perfect for freezing, baking, and just snacking on! You can find more information here on the Boston Organics website. I wish the ice cream could be as brilliantly colored as the blueberry milk and cookies gelato above, but I was worried that adding too much blueberry compote to the ice cream base might make it too icy. 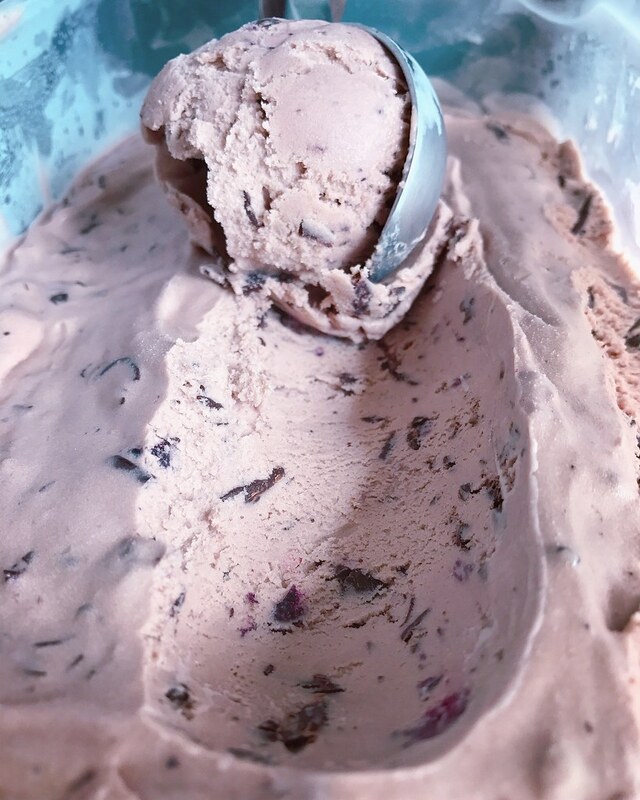 Regardless, the flavor is incredible; the sweetness of the caramel is tempered by the tartness of the blueberries, and the crackly dark chocolate freckles adds a fun textural component. Heat the blueberries and 2 tablespoons of sugar in a small saucepan until it comes to a boil. Gently mash the blueberries and remove from heat. Mix a couple tablespoons of the milk with the cornstarch to make a slurry and set aside. Whisk the cream cheese and kosher salt in a large bowl and set aside. Mix the heavy cream and corn syrup in a measuring cup with a spout. Add the remaining 2/3 cup of sugar to a 4-quart saucepan and heat over medium heat. Wait until a layer of sugar has melted and turned amber before stirring with a heatproof spatula. Once all the sugar has melted and is a dark amber remove from heat and add about 1/4 cup of the heavy cream mixture while stirring. It will violently erupt with steam so be careful! Continue to stir and add more and more of the cream until it is all incorporated. Return the pan to medium-high heat and add the rest of the milk. Bring to a boil and cook for 4 minutes. Whisk in the cornstarch slurry and bring back to a boil. Continue to cook and stir until slightly thickened, about one minute. Add a little of the hot cream mixture to the cream cheese and whisk until the cream cheese is dissolved. Add the rest of the cream mixture, vanilla, and blueberry compote and mix. Chill the mixture, then churn in an ice cream maker according to the manufacturer's instructions. While the ice cream is churning, place the chopped chocolate in a plastic sandwich bag, seal it shut, and then place in some very hot water. Occasionally squeeze the chocolate around until it is all melted. Remove the bag from the water and dry the outside. Keep the chocolate melted but not hot. 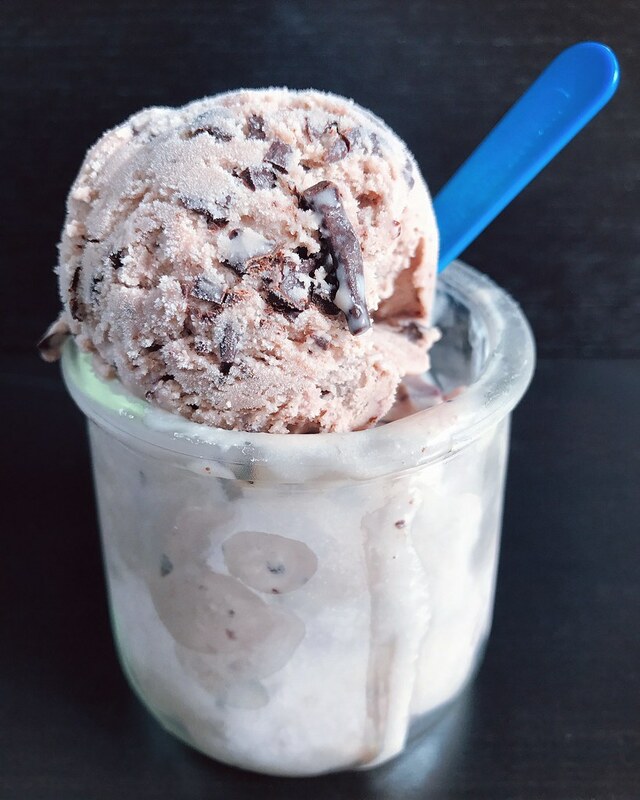 Once the ice cream is almost done churning, snip a corner off of the sandwich bag and squeeze a steady stream of the melted chocolate into the ice cream while it continues to churn. Pack the churned ice cream into a storage container and freeze for at least 4 hours. *If you can't get your hands on wild Maine blueberries, you can use regular blueberries to make the compote, but you may want to boil it longer to reduce it further and add some more sugar as needed. I've been wanting to try making a full-size crepe cake ever since I made those Nutelle mini crepe cakes 3 years ago, and seeing a recent picture of my friend Serene's matcha crepe cake re-inspired me. 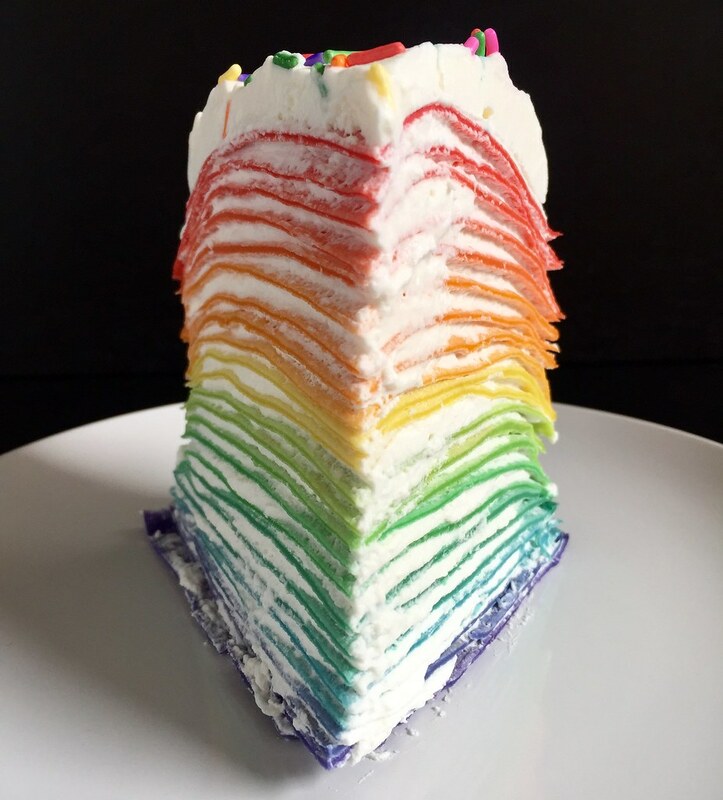 But when I couldn't decide which flavor crepe cake to make, my other friend Christine reminded me of a rainbow crepe cake she had shown me on Instagram before. I knew what I must do. 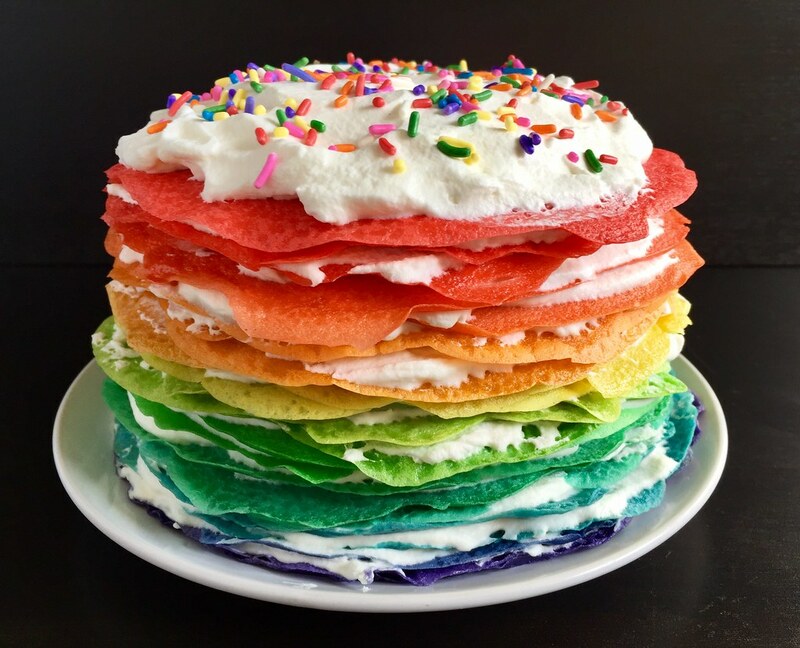 After some research on-line, it seemed that most rainbow crepe cakes used 6 discrete colors of crepes, but I wanted to try to blend them together so that the color of the crepes was more progressive. I figured I'd make 2 crepes of each color, then start mixing the leftover batter together a little at a time. This just made an already complicated process even more complicated, but I'm rather pleased with the result. 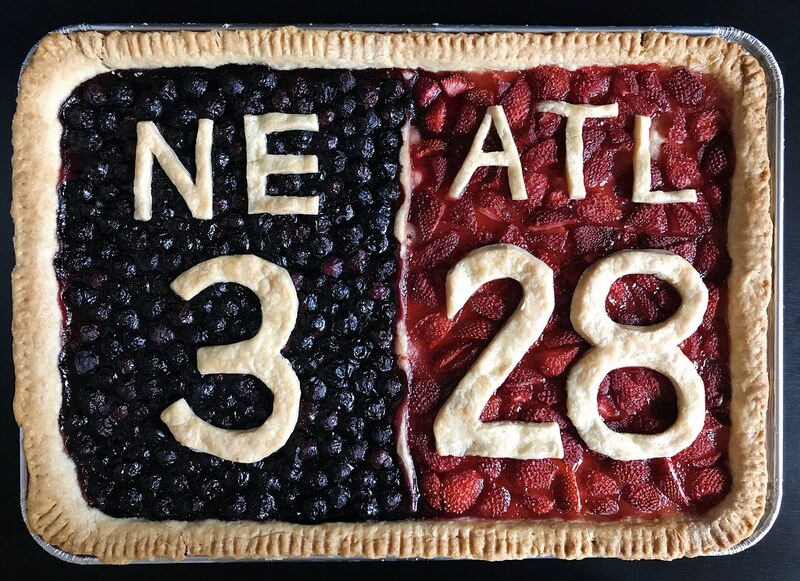 If you'd rather just leave it as 6 discrete colors, just divide the batter evenly between 6 bowls before coloring. But if you'd like to try the ombré approach, you can put 1/3 less batter in the bowls for the red and purple since you're only blending those one way instead of two (a scale makes it a lot easier to figure out). 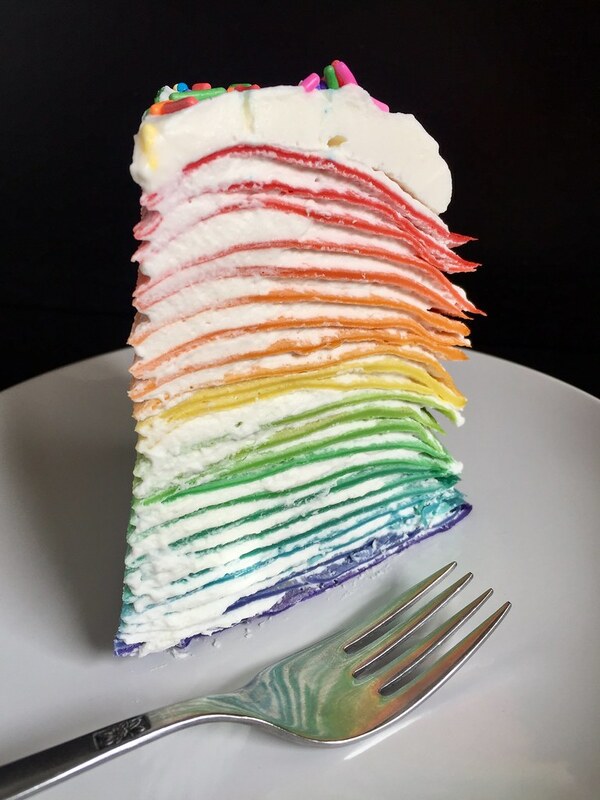 I decided to just use sweetened whipped cream for the filling (a recommendation from Serene) instead of pastry cream plus whipped cream like a lot of other recipes use because it was easier, and I liked the pure white color of the filling against the rainbow of colors. Serene also suggested freezing the cake if not serving right away to help stabilize it and prevent weeping. 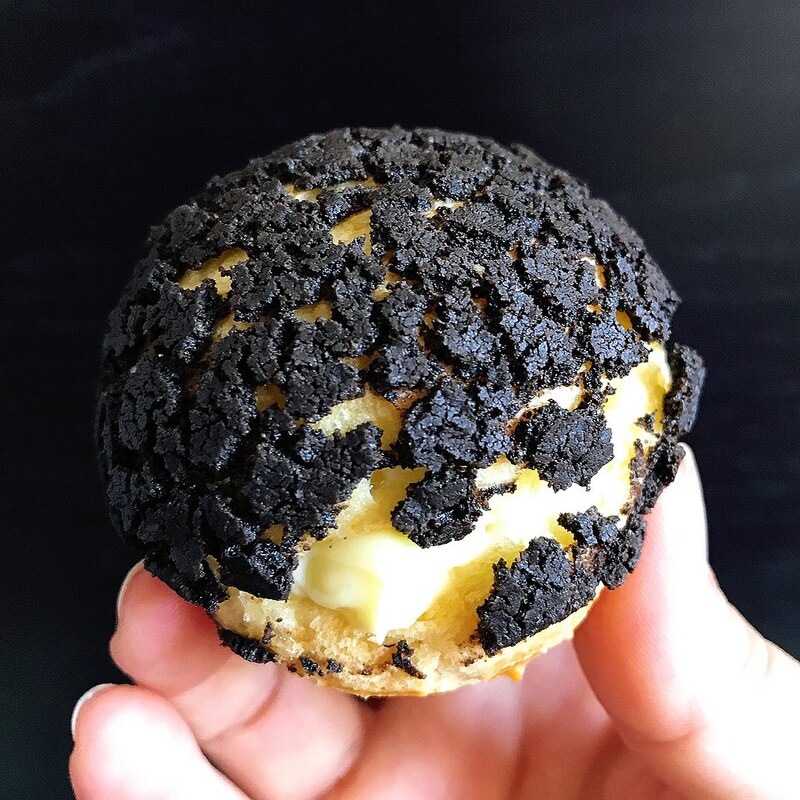 Combine the eggs, milk, water, flour, sugar, butter, and 2 teaspoons of vanilla extract in a blender and pulse for 10 seconds. 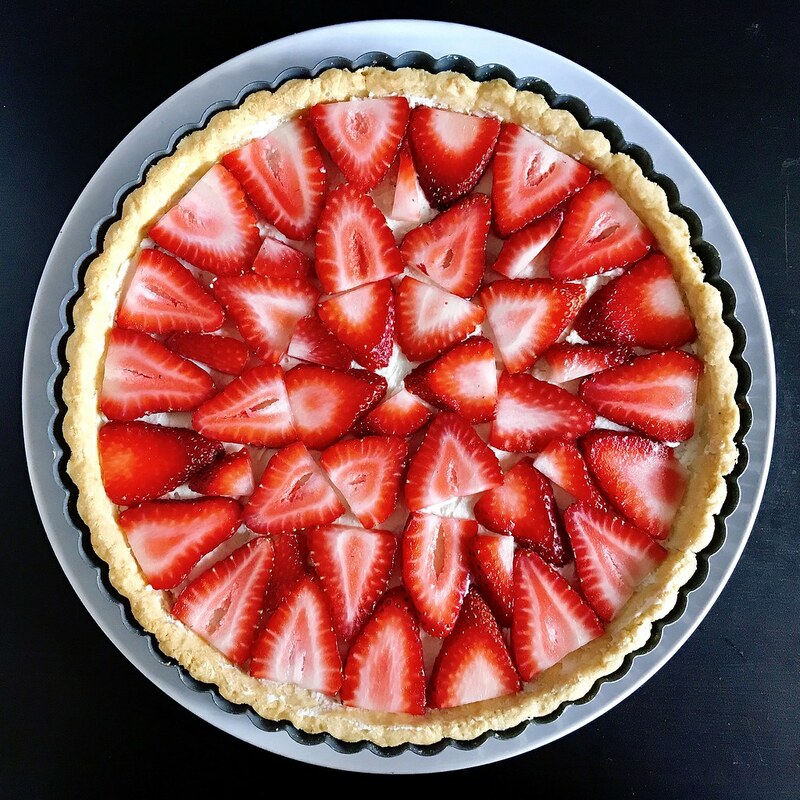 Let rest in the fridge for at least an hour or overnight. Divide the batter into 6 bowls, with about 1/3 less in two of the bowls. Color the bowls with less batter in them red and purple. Color the other bowls orange, yellow, green, and blue. Lightly grease a non-stick pan with oil and heat over medium-low. Pour a scant 1/4 cup of the purple batter into the middle of the pan and swirl to spread into an even circle. Cook for 30 seconds and flip carefully. Cook for another 10 seconds, then transfer to a cutting board or baking sheet lined with parchment paper. Repeat, making 2 crepes each of all 6 colors. Once the crepes have cooled on the parchment paper you can start stacking them on a plate. 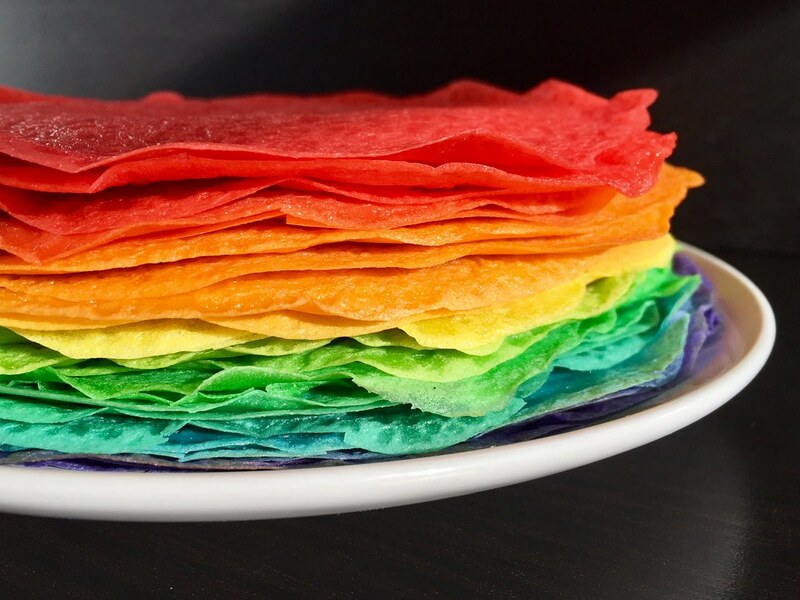 Gradually mix the rainbow-adjacent colors together to make the rest of the crepes. You should end up with about 24 crepes, more if you don't mess any up. I messed up 2 or 3 (the first one is always a fail) and ended up with 24. Beat the heavy cream to soft peaks, then add the powdered sugar and remaining teaspoon of vanilla extract. Beat again to barely stiff peaks. 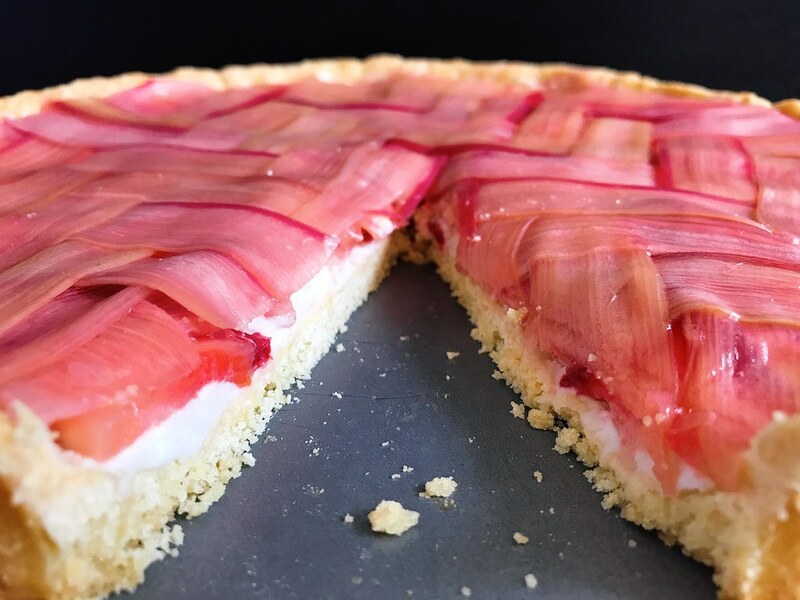 Place a purple crepe on a plate and spread a thin layer of the whipped cream on top, leaving a little bit of a border. 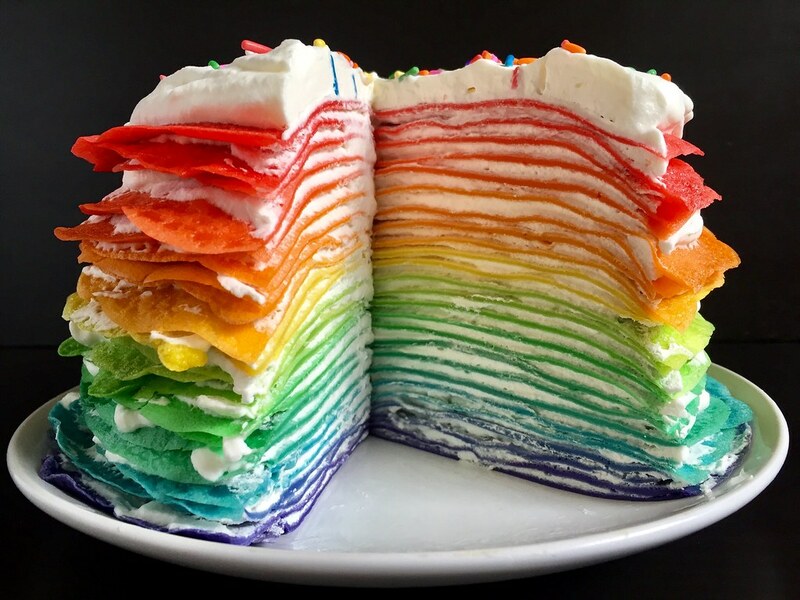 Top with another crepe and continue with alternating layers of crepes and whipped cream. If you have any whipped cream leftover, frost the top and garnish with sprinkles, if you like. Chill until ready to serve. 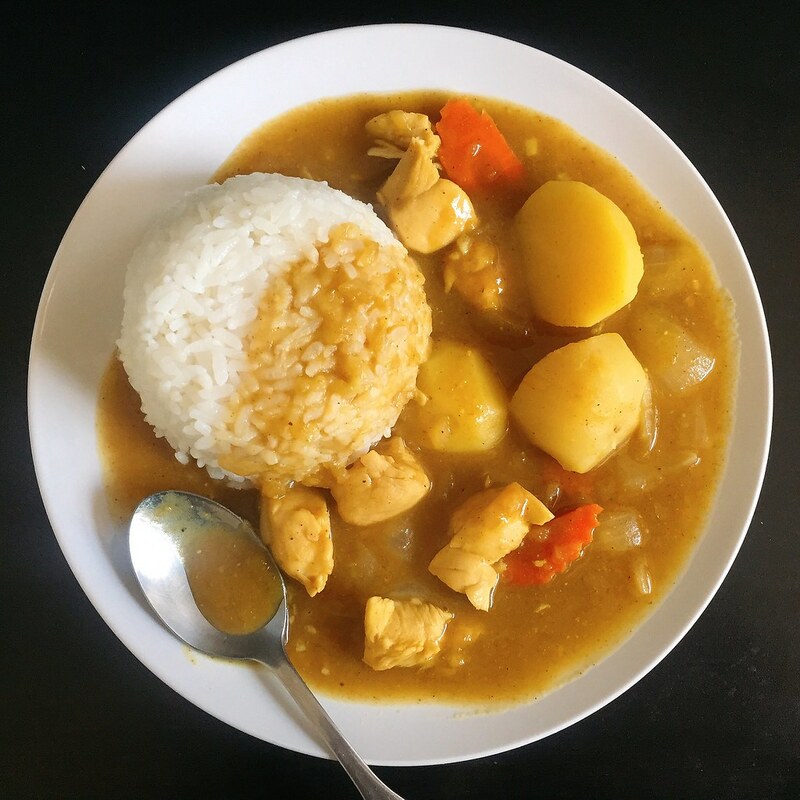 If you’ve ever made Japanese curry rice from one of those store-bought curry blocks, you know how delicious and easy it is, but did you know it’s almost as easy to make it from scratch? And considering the palm oil, MSG, and preservatives used in the blocks, it’s probably a lot healthier to make your own. I pretty much followed the chicken curry rice recipe from Just One Cookbook except I caramelized the onions as recommended by Marc from No Recipes and Serious Eats. I also used chicken breast instead of chicken thighs because I really, really hate dark meat. 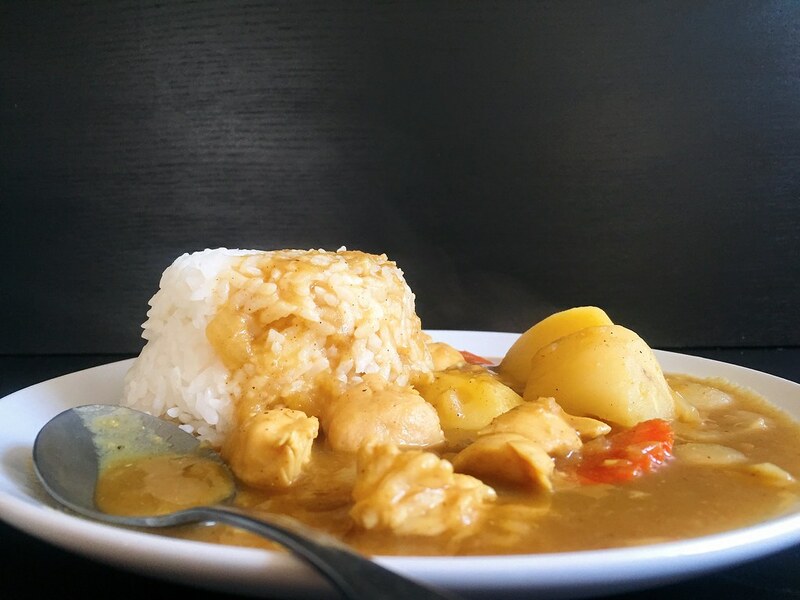 Another great thing about making your own curry roux is that it’s easily customizable. If you prefer it spicier, add cayenne pepper; if you prefer it sweeter add honey, etc. This recipe makes a slightly sweet, medium-mild spicy curry. 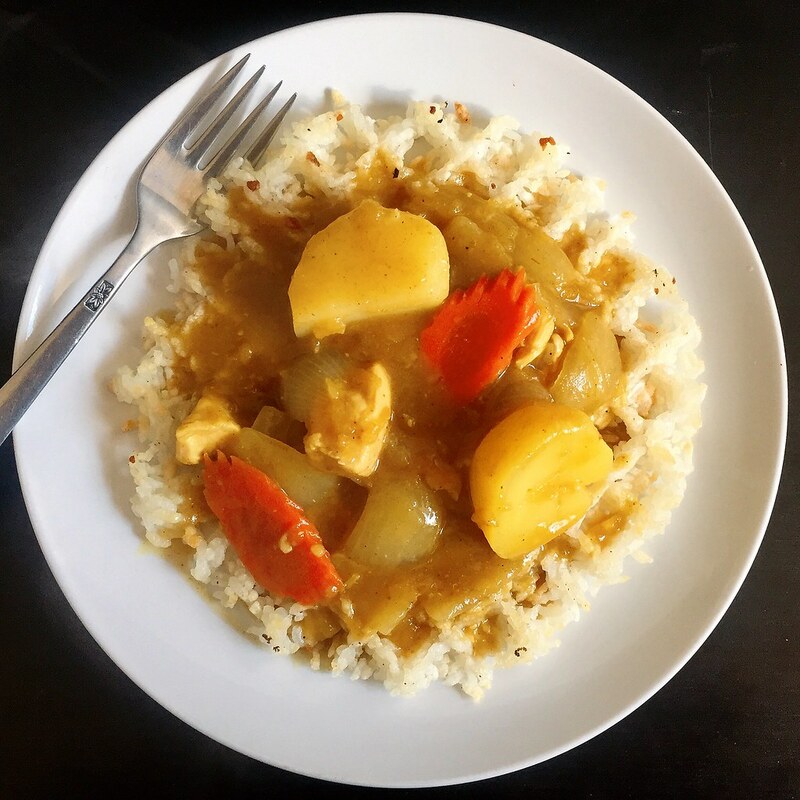 Japanese curry is usually served with steamed rice, but if you want to have a little more fun, I’d highly suggest waffling some day-old cooked rice. 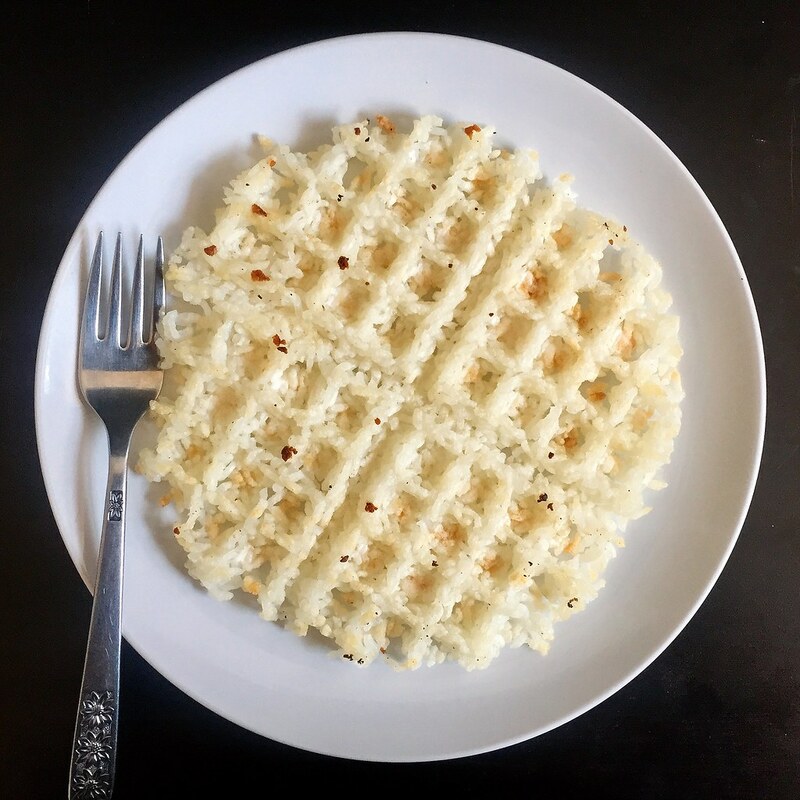 The rice gets crispy-crunchy-toasty-chewy and adds a really interesting texture. Cut the chicken into bite-sized pieces and season with salt and pepper. Add the onions to a large pot or Dutch oven over medium heat. Cook with a large pinch of salt until dry and just starting to color. Add a tablespoon of oil, mix, and continue to cook until the onions start sticking to the bottom again. Add the rest of the oil and continue to cook until caramelized. Add the minced garlic, grated ginger, and chicken. Cook until the chicken turns white. Add the chopped carrot and chicken broth and bring to a boil. Peel the apple, coarsely grate, and add to the pot. Peel the potatoes, cut into bite-sized chunks, and add to the pot. Simmer for 20 minutes until the potatoes are tender. In the meantime, make the curry roux by melting the butter in a small pan over medium-low heat. Add the flour and stir until the roux starts to get darker, about 5-10 minutes. Mix in the garam masala and curry powder and take off the heat once combined. When the potatoes are done, add some of the hot liquid to the roux and whisk until the roux is loose, adding more liquid as necessary. Add back to the pot and bring back to a boil. Stir in the soy sauce and ketchup. Taste, and add the honey if you'd prefer it sweeter. Simmer until the curry has thickened. Serve with cooked rice.